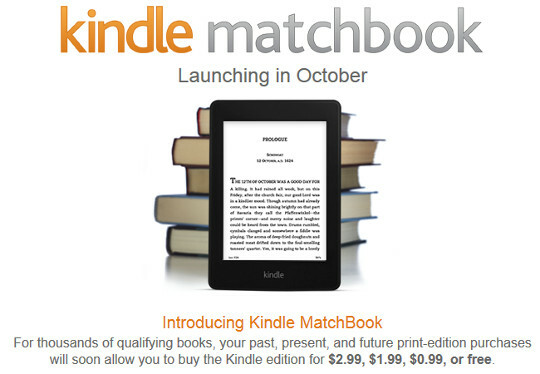 Earlier this week, before announcing the Kindle Paperwhite 2, Amazon made headlines by introducing something they plan on introducing in October called Kindle MatchBook (no, it’s not Kindle-branded matches). Kindle MatchBook allows customers who purchase the printed copy of a book to get the ebook copy for cheap—$2.99, $1.99, or $0.99—or even free. What’s great about this is that it goes back to past purchases too, dating all the way back to 1995 when Amazon first started selling books online. There are a couple of catches, of course. The main one being that publishers have to agree to it. Right now only a few publishers are on board, with about 10,000 books enrolled. Some authors include Ray Bradbury, Michael Crichton, Blake Crouch, James Rollins, Jodi Picoult, Neil Gaiman, Marcus Sakey, Wally Lamb, Jo Nesbo, Neal Stephenson, and J.A. Jance. Amazon is trying to get more publishers to enroll their books in the Kindle MatchBook program—right now that’s the primary purpose of the announcement, seeing as how people can’t start taking advantage of it until next month. The second stipulation is a little less clear. Reading between the lines it would appear that in order to get the Kindle ebook at a discount or for free the paper book would have to be purchased from Amazon themselves and not from one of their third-party merchants, and it has to be purchased new, not used. This isn’t stated specifically anywhere, but it’s implied. We’ll have to wait until October for the finer details, I guess. Despite some of the limitations, Kindle MatchBook sounds like a great idea. Bundling ebooks with paper books is something a lot of people would like to see happen. The biggest problem is going to be getting publishers on board with it, especially the Big 5. But if Amazon can pull it off this could be yet another big step in the book industry. Barnes and Noble would be wise to copy this idea pronto, especially if they could make it work with Textbooks. I am wondering if you only get this option if you have a Kindle device? I have purchased MUCH in the last 15 years from Amazon; I have a Prime account as well. I don’t have any Kindles however. I have a couple dozen Kindle books that I read on my Nexus 7 and my Nooks. I hate the Kindle for Android app, but use it a few things like Audible syncs and such. Anyway, it is implied maybe that it is only through a new PW2 that you get this benefit. What are your thoughts? I am intrigued by this perk, plus the Goodreads tie in and the in-line footnotes. I am just not crazy about the fact that my library is all epubs. I know I can convert in calibre and transfer via USB but for some reason it is a stumbling block to me that they won’t add epub support on their devices. Probably just stubborn on my part right? LOL! Yeah, the whole ‘support epub’ movement was something that a lot people were supporting/asking for back in 2009-2010. It may have been a possibility for Amazon to give in and go that route then, but now there really is no reason to hope that epub support on Kindle will ever happen. Amazon has their own proprietary eBook format that they have invested in over the years that it mobi-based. Amazon decided early on that the .mobi format would be the only one their Kindle eReader devices support. The line is drawn in the sand. The Kindle is a mobi reader. From everything I’ve read I don’t get the impression that you have own a Kindle device for this. The Kindle edition will work with any Kindle app so I think that’s the route they’ll go with it. I too wish Amazon would allow people to use ePubs. A vast majority of my library is in ePub as well and it’s a pain to have to covert them to AZW or KF8. As for a new e-reader from B&N, I surely hope so. My wife talks about this almost daily, jumping about like a little girl. She can hardly wait to see how this deal turns out. Then there are the5 or 6 thousand book I’ve gotten from them, being an early adopter. Nathan, I think this is a great feature that I would certainly use. But I was wondering if you noticed a slight change in how they present another major feature they have always talked about in the past: battery life. Gone are the days when Amazon would come out and explicitly state “1 Month of battery life.” Now they say “battery lasts weeks, not hours.” What does this mean? Has battery life dropped to 2 or 3 weeks due to the new software, lighting feature, or display? This is a definite change in how they talk about Kindle’s battery life. I think they are probably just starting to be more realistic when advertising battery life. Saying that it lasts 2 months is a definite stretch for most users. I notice Amazon still advertises up to 8 weeks reading for 30 minutes per day in the specs so it doesn’t sound like overall battery life has changed, just the way they are advertising it. I am thrilled with this news bulletin! I read books on my iPad but have to buy the hard copy or get the library book for my husband. He likes the feel of the book in his hands…the current system is costing me a small fortune and we have hardbound books stacked up 3 feet high….end up taking them to the library. I am going to have to start reading the hardbounds which Amazon isn’t going to appreciate.